The '5 Stages of Grief' are a Myth! "I've already been angry! I thought I had done this 'stage' already!" The popularized theory of a 5 smooth, distinct, and fluid stages of grief and loss has many under the false idea that when you are "done" with one stage, you move on to the next, until you are one day – done. I wish that this was true. Grief and the grieving process is not so neat and orderly. None of us will ever grieve in a nice straight line through smooth stages. Truth be told, we are probably experiencing every "stage" at the same time. We certainly do not do it like this pop culture portrayal would have you think. The '5 Stages' model of grief was not meant for you. The stages model of grief is the creation of Elizabeth Kubler-Ross from her work and study of terminally ill patients. Kubler-Ross discovered that there were 5 distinct stages, as she called them, that her subjects would progress through on their way to accepting their own mortality - not life. Her book, On Death and Dying, was a wide spread success and the stages model leapt from the study of death and was applied to any loss... leading to confusion and the feelings of betrayal. Many clients have asked: "If the stages model was for the dying - what about a model for the living?" That is where the Pathway Through Grief comes in, and where your personal healing and acceptance of a life with loss begins. When you experience the death of a loved one, the loss of a job, or any other loss...you are not coming to terms with and accepting your own end - you go on living. One reason loss hurts so bad is that you do go on, even when there seems to be no light through the mist and darkness. A Pathway Through Grief program meant just for you! you never tell someone they are 'doing it wrong'. What works for one person may not be what works for you. We gain some very important language from the Kubler-Ross Stages model that really helps steady the emotional free-fall. In the Pathways Through Grief program, I help you understand and manage each of these. Bargaining, Denial, and Acceptance are all part of the grief process and finding your new life after loss - your life WITH loss. Bargaining, denial, and the emotions they bring are not bad. They are actually the brakes that slow down your emotional decent and help your logic brain catch-up to the illogical experience around you. Like a spare parachute, or the extra air tank a scuba diver wears on the belt just in case of an emergency. We bargain a lot of things in life. When my grandfather died of a long battle with cancer, I was devastated. I had let his lawn get a bit unruly the weeks before his death, and I was embarrassed and disappointed that I had "let him down" though he never knew. I spent an entire afternoon mowing, raking, de-thatching, and mowing again to get perfect lines before the family showed up. The whole time telling myself that it was making grandpa happy and that it is what he would have wanted. Finally collapsing into the sadness I was covering with the yard work, I spent nearly an hour face down on the lawn sobbing and releasing the emotional pain. Bargaining had allowed me to release the physical adrenaline and anguish I was feeling in preparation for the emotional let down that needed to come. By the time the funeral was held, the lawn looked as great as I was feeling. When you know how to use bargaining and denial effectively, you will find peace and understanding knowing you are doing just fine. When you are allowed to by those who are supporting you, you will do even better. Are you looking for a way to overcome the emotions and feeling "stuck" in a stage? Want a community of caring and understanding people who also are moving forward on the Pathway Through Grief? Click HERE to discover how easy it is to find happiness and peace after loss. P.S. Don't miss your opportunity to get the FREE eBook Good Grief - Really! and a special offer for the accompanying masterclass. 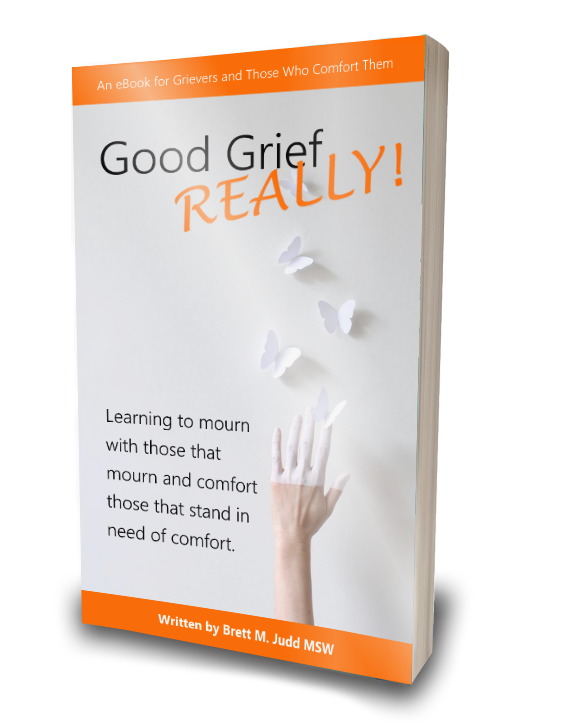 Evaluate your own level of grief and discover your Life With Loss in our free eBook how to find good grief - really!